We have a gargantuan credit bubble: $230 trillion in global debt—three times the amount we had during the 2008-09 crisis. Deutsche Bank, the epicenter of European finance, is on the brink of collapse and about to bring the EU and the global economy with it. And fearing that global central banks have lost control, investors are starting to panic. Last week, we saw the largest outflow of money from equity funds in the last three months. It’s a frightening time to be a mainstream “I trust the Fed to tuck me in bed at night” investor. Our recent history is filled with global financial crises, bubbles bursting, corporate collapses and hedge fund blow-ups. And the media narratives from these meltdowns have always concentrated on the losers… the investors who got burned… the retirees who lost everything. The press is fascinated with losers. And the public follows the lead of the press. And that’s a major reason why mainstream investors freak out at times likes these. But during market crises, there are winners too. The press doesn’t spend its time focusing on them. Yet they do exist. 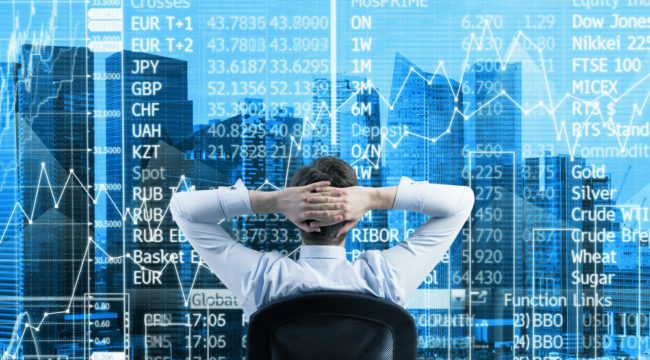 It compares MSCI World Stock Index versus the Barclay TOP50 Index, which replicates the overall composition of the managed futures industry that have trend following strategies at their core. 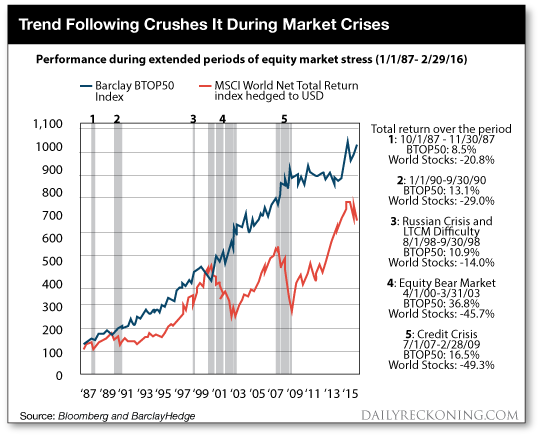 As you can see, during times of extreme market stress in recent decades, trend following strategies annihilated equity market performance. It’s not even close. Historically, trend followers have been the biggest winners during crisis periods—so regular is trend following success during black swans that after 20 years it still shocks me. Look, I bring you my spin on world-changing developments because I want you to be aware of the things that are shaping your world and creating the trends you can profit from. The purpose isn’t to instill fear. As trend followers, we don’t let these developments change our strategy. My trend following decision-making doesn’t involve the things that cause you to make mistakes during times of crisis, like prediction, discretion, guesses, gut feelings, or hunches. We don’t do any of that, so you don’t have to worry. And you don’t have to fear the 24-hour news cycles or be concerned about daily turbulence or sensational hype. You can just let go and let my system work. So don’t get caught up in the negativity from the next end of the world headline you see. As trend followers, we have our stops in place to protect us from ruinous downside moves. And our system is constantly tracking the markets for profitable trends in up or down markets to offset any losses. Keep that in mind the next time you find yourself getting tense from current events. It will help bring your heart rate down. Ed. Note: Sign up for a FREE subscription to The Daily Reckoning, and you’ll receive regular insights for specific profit opportunities. By taking advantage now, you’re ensuring that you’ll be set up for updates and issues in the future. It’s FREE.